Facebook has been translated into dozens of foreign languages, but a hate group on the site in Serbian was left completely unmoderated, despite a tremendous user outcry against it. The group "NOŽ ŽICA SREBRENICA!!" is a "Just for fun - Fan Club" of fugitive war criminal General Ratko Mladic, who was accused of genocide and crimes against humanity by an International Criminal Tribunal in 2004. Mladic commanded the Army of the Srpska Republic in the 1995 Srebrenica Massacre of over 8,000 Bosnian Muslims. Over 1,000 supporters joined the group, which claimed it was "for all those that are against foreign Islam, for all those who are against Muslim fundamentalists and Mujahideen, for everyone who respects the work of General Mladic, and for everyone who thinks that Muslims are best served roasted, and swimming in sulfuric acid." 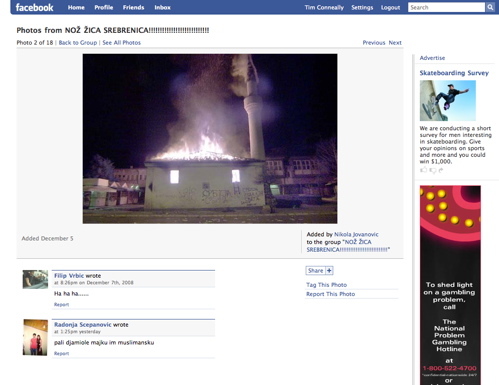 The existence of this group caused an uproar among Facebook users in the Balkans, leading a user named Azrudin Pecanin and two others to form a group to get "Noz Zica Srebrenica" removed. Despite having a membership of over 11,000 who were instructed to report the offending group, the hate group remained in place. Even worse, when contacted this afternoon, Facebook had no idea of either group's existence. BetaNews spoke to Facebook today to discuss the site's policy on the moderation of foreign language groups. A representative from the social network said, "Facebook supports the free flow of information, and groups provide a forum for discussing important issues. However, Facebook will remove any groups which are violent or threatening." The group's page said it was made "with the goal of making all normal people see the danger of radical Islam through jokes and fun, to share their opinions without spreading hate on any level." Included in the group's hosted imagery, however, was a user-uploaded photograph of a burning mosque, and the mention of disposing of Muslims in sulfuric acid -- a wartime method of rendering human remains untraceable -- cut too close to the bone, so to speak.